“A dog is man’s best friend.” There’s something primal about the relationship between a man – the master – and his canine. 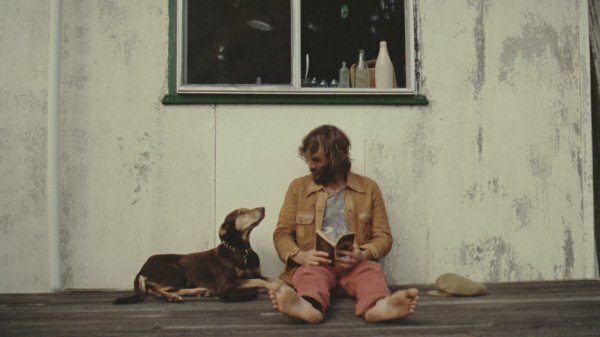 It’s hard to imagine Angus Stone thinking of himself as the master of any animal. He’s probably a vegan (respectfully). In the video for “Wooden Chair,” Angus cuts a classic troubadour figure, travelling around the beautiful Australian countryside, dog and acoustic guitar in tow. His destination is a bonfire bush party with firecrackers and slow-mo dancing. Man becomes beast, when Angus and friends wear wolf masks and get around on all fours. The nostalgic cinematography of the video is stunning, and the ideal backdrop for the folky warmth of Stone’s sound. We would expect nothing less from one half of Australia’s ridiculously good-looking, barefoot, designer-boho-chic, unwashed hair sibling outfit.